Hayley's hinterland wedding combined her two fave styles - boho and classic elegance with the help of her Maleny bridal hair and makeup artist. Hayley’s wedding to her love, Cameron took place at Flaxton Gardens in the charming Sunshine Coast hinterland. Moseying through the vineyard, bride Hayley certainly looked the part. 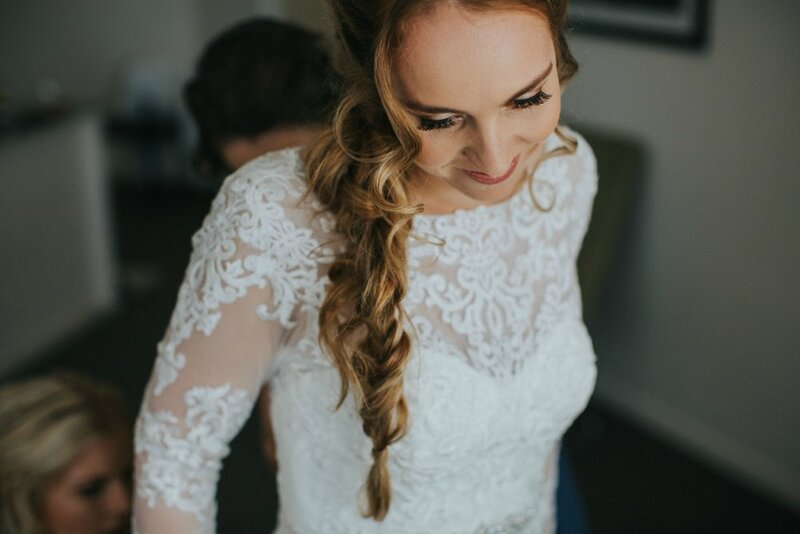 Her beauty squad from Allure Bridal Stylists turned her into the elegant boho bride she had been dreaming of with a full voluminous boho braid to die for. Warm tones with a glowing finish, her makeup was complemented by the wedding’s classy colour palette. The day after the proposal it was straight into planning time. I have always loved bohemian-inspired weddings, but there is also something special about an elegant wedding. I decided that I wanted to combine both of these inspirations, to best suit both my personality and the venue. This decision was made after several weeks of scrolling through wedding blogs and Instagram pages and of course plenty of Pinterest pinning. After looking at the beautiful work the amazing girls did at Allure Bridal Stylists I decided to use their creative skills to achieve my hair and make up wedding goals. Rachel took on board my simplicity with makeup up, creating a natural glowing complexion, complimented with a natural tinted lip and dusty eyes. Styling and braiding my hair has always been a passion of mine. Natasha worked with my hair to create a twisted braid with an elegant hair piece, to incorporate my inspiration from both Bohemian and elegant wedding ideas. With my bridesmaids, I wanted to incorporate the braid theme throughout their hair also. We decided on a half-up-half-down look to fit within the vibe for for the wedding. The hair and makeup was perfect for the day and suited the vibe of the wedding perfectly, the girls from Allure did an incredible job!